Car accident fatalities are always tragic, but it can be especially devastating when a young child or infant is killed by a dangerous or reckless driver. Our auto accident attorneys in Massachusetts know that no matter how carefully a parent or guardian drives, a child’s life could be endangered by other negligent motorists on the road. While there is nothing a parent can do to keep dangerous drivers off the road, parents can help to protect their children by making sure their kids are in a car seat or wearing a seat belt at all times. A National Highway Traffic Safety Administration (NHTSA) news release has emphasized the importance of properly securing children in a vehicle, offering some tips to parents and caregivers to help keep kids safe in case an auto accident happens. The NHTSA cautions parents that car accidents are a leading cause of death and injury for kids. In fact, in 2011 alone, there were an average of almost two deaths per day in car accidents involving kids under age 13. During this same time period, 338 kids aged 13 and under were injured in cars, SUVs, pickup trucks and vans. 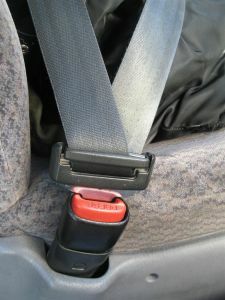 In many of the situations where children were injured or killed, they were not secured in the vehicle using either a seat belt or a car seat. In fact, data from the Department of Transportation shows that more than one third of all kids age 13 or younger who were killed in passenger vehicle accidents in 2011 either were not in a car seat or did not have a seat belt on at the time of the collision. In response to the high death rates among kids who aren’t secured, NHTSA Administration David Strickland reminded parents: “Car seats, when correctly installed and used, provide life-saving and injury-reducing benefits for child passengers.” As many as 10,000 lives were saved through the use of car seats and other child restraints from 1975 to 2011, and more children continue to be protected by car seats or seat belts every day. Making sure your child is in the appropriate car seat or child restraint based on his/her size and age. Carefully reading the vehicle owner’s manual and car seat manufacturing instructions in order to make sure the seat is installed properly. Having the car seat installation checked by a Certified Child Passenger Safety Technician and a local car-seat inspection station. Registering both car and booster seats at the SaferCar.gov website in order to be informed of a recall. Wearing your seat belt as a good example for kids. By following these tips, parents can hopefully help to reduce the chances that their child will be seriously injured or killed if an auto accident occurs. NHTSA Warns Consumers of Tire Dangers in Hot Weather, Boston Personal Injury Attorney Blog July 31, 2013.